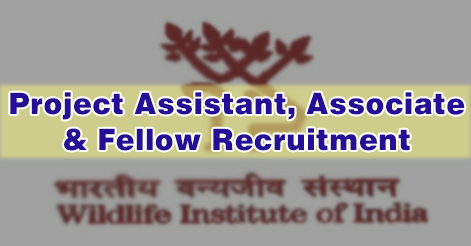 The Wildlife Institute of India (WII), Dehradun invites application for engaging Junior Technical Assistant, Junior Research Fellow & Senior Research Fellow posts in various department. This recruitment is purly contractual base. Interested candidate may apply on before 07 July 2017. Junior Technical Assistant (01) 01 16000 + HRA (as admissible) 26 years Candidate must have Bachelors’ Degree in any discipline with 60% aggregated marks and above from a recognized university. Junior Research Fellow (01) 01 Rs. 25,000/- + HRA (as admissible) 28 years Candidate must have Masters Degree in Zoology/ Fishery Science/ Wildlife Biology/ Wildlife Science/ Environmental Science/Life Sciences with a minimum of 60% aggregate marks from a recognized University. Junior Project Fellow-Bird (01) 01 Rs. 25,000/- + HRA (as admissible) 30 years Candidates should have Master’s degree in Wildlife Sciences/ Zoology/ Forestry/ Environmental Sciences or Management/ Life Sciences/ Biodiversity and Conservation/ with a minimum of 60% aggregate marks from a recognized University. Junior Project Fellow-HWC (03) 03 Rs. 16,000/- + HRA (as admissible) 30 years Candidate should have Master’s degree in Wildlife Sciences/ Zoology/ Forestry/ Environmental Sciences or Management/ Life Sciences/ Biodiversity and Conservation with a minimum of 60% aggregate marks from a recognized University. Senior Research Fellow (01) 01 Rs. 28,000/- + HRA (as admissible) 32 years Candidate must have Masters’ in Wildlife Sciences/Zoology/Life Sciences/Forestry/Environmental Management or any other subject related to biodiversity and conservation with a minimum aggregate score of 60%. Junior Research Fellow (01) 01 Rs. 25,000/- + HRA (as admissible) 28 years Candidate must have Masters’ Degree in Wildlife Science/Zoology/Botany /Life Science/ Biological Sciences/ Environmental Sciences/Biotechnology or any comparable discipline with a minimum of 60% aggregate marks from a recognized University. The selection of the candidates will be based on their performance in written exam & interview. Candidates may apply o0nline through the official website www.wii.gov.in. They can register online till 07 July 2017. Candidates are requested to submit application fee of Rs. 500/- (Rupees Five Hundred only). Payment can be made via Internet banking / Debit Card / Credit Card through our online secured payment gateway. 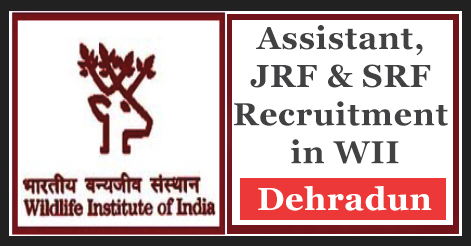 Help us to improve this article/job posting "Assistant, JRF & SRF Recruitment in WII Dehradun". We would be glad if you can comment below and provide your valuable suggestions and feedback. If this page have any wrong information/list or out of context content, then you can report us as well. Sir I am 34 years old and in graduation I had social science. Can I also apply for the post? are m.sc in Botany also eligible to apply? Can Please specify? Dear sir/maim i m post graduate in biotechnology (in 2015), so can i apply for any of these post? I recently Completed My MSc with major Subject Zoology with First class Result . and In free Ranging Condition At Sasan Gir For Spotted Deer , Black Buck National Park (Velavadar) , and sakarbaug Zoo junagadh. Now I am Going to Doing MPhil in Zoology subject. I am Student Of Zoology At School of Science , Department Of Zoology Ahemedabad Gujarat. I recently completed my MSc Degree. In Behaviour Pattern of Selected herbivores ( Spotted Deer, Sambar , Black Buck in captivity and In Free ranging Condition. Now I recently Pass MPhil entrance Exam At Gujarat university. now I want to join project Work at Wild life institute of India . Please Sir /mam its my kindly request to you that Please provide information and Guidance. Am I eligible to apply for jrf in WII?